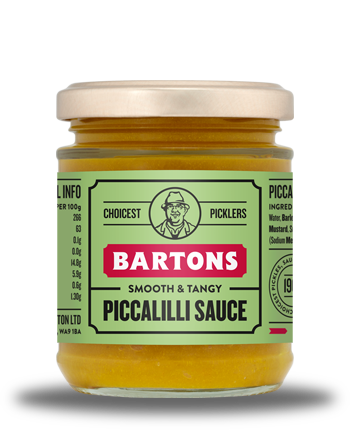 Bartons Piccalilli Sauce is a smooth and glossy, mild mustard, turmeric and vinegar based Piccalilli without any of the vegetables added. It is a tangy relish sauce which can be eaten with cold meats such as ham, sandwiches, snacks and salads. Brilliant with chips. For those who need more than a jar, we also have catering sizes. Water, barley malt vinegar, cornflour, sugar, mustard, turmeric, acetic acid, salt.